These photographs are available for news media outlet use in coverage of Samaritan’s Purse-related stories. If your news outlet uses a photograph, please credit: “Courtesy of Samaritan’s Purse.” These photographs are not for commercial use. Franklin Graham, president of Samaritan's Purse and the Billy Graham Evangelistic Association. Bangladesh—Franklin Graham visits the Samaritan's Purse diphtheria treatment center. Lake Clark, Alaska—Franklin Graham and his wife Jane welcome wounded veterans and their spouses as couples arrive at Operation Heal Our Patriots for a week of Biblically based marriage enrichment. Bangladesh—Franklin Graham thanks Samaritan’s Purse nurses who are providing expert care at the organization’s diphtheria treatment center. Puerto Rico—Franklin Graham distributes solar lights and tarp for emergency shelter to families devastated by Hurricane Maria. Houston, Texas—Franklin Graham prays for disaster relief volunteers as they give of their time and energy to help families recover from Hurricane Harvey. 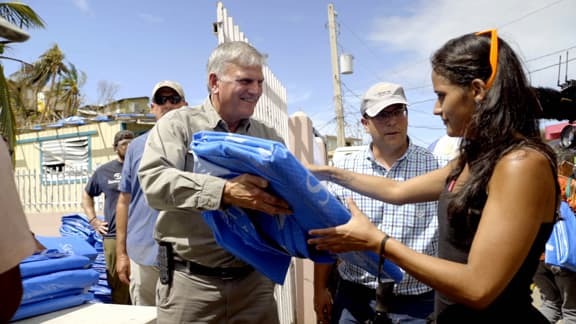 New Orleans, Louisiana—Franklin Graham assesses Hurricane Katrina damage, creating a plan for Samaritan's Purse to immediately begin work. Houston, Texas—Franklin Graham shares the love of Jesus Christ with a homeowner devastated by Hurricane Harvey. Mosul, Iraq—Franklin Graham visits patients at the Samaritan's Purse emergency field hospital. Saipan—After Typhoon Yutu devastated the Northern Mariana Islands of Saipan and Tinian, Samaritan’s Purse provided heavy-duty plastic tarps to more than 3,500 families. Saipan—Thousands of families on the islands of Saipan and Tinian were left without basic necessities like shelter, clean water and electricity following Typhoon Yutu. Samaritan's Purse responded with 80+ tons of critical relief supplies including heavy-duty plastic tarp, generators and solar lights. Saipan—Samaritan’s Purse provided household water filtration units to more than 5,000 families affected by Typhoon Yutu on the Pacific island of Saipan. Saipan—Samaritan’s Purse has helped more than 6,000 families on the Northern Mariana Islands of Saipan and Tinian recover physically and spiritually from Typhoon Yutu. The Samaritan's Purse's DC-8 has airlifted 3.8+ million pounds of relief supplies to victims of war, famine, poverty and natural disaster. St. Martin—In the days after Hurricane Irma, Samaritan's Purse distributed food, water and relief supplies to approximately 1,100 families. Qaraqosh, Iraq—From 2014-2016, nearly 50,000 Christians fled for their lives after ISIS took control of their village in Qaraqosh, Iraq. Samaritan's Purse helped nearly 1,000 families return by rebuilding their homes. Vietnam—Survivors of Typhoon Damrey were grateful as relief supplies from Samaritan's Purse arrived in affected areas of Vietnam. Puerto Rico—Tom Ovington, Samaritan's Purse program manager (left), and Pastor Anibal Serrano celebrate that Samaritan’s Purse rebuilt his church after Hurricane Maria. Puerto Rico—Cecilia Burgos (center) was the first recipient of a solar energy system after Hurricane Maria. She is joined by daughter Maria Burgos (left) and granddaughter Cecilia Martinez (right). Puerto Rico—Samaritan’s Purse staff work to install solar panels for families still without power after Hurricane Maria. Bangladesh—Samaritan’s Purse treats Rohingya refugees affected by the diphtheria outbreak. Bangladesh—Jodie Bushy, a nurse at the Samaritan's Purse diphtheria treatment center, cares for a patient. Dominica—Samaritan’s Purse provided surge capacity to a hospital severely damaged by Hurricane Maria. Here, Erin Stephenson (RN) checks the blood pressure of a patient. Dominica—Samaritan’s Purse provided surge capacity to a local hospital in Dominica that was severely damaged by Hurricane Maria. Canovanas, Puerto Rico—Samaritan’s Purse distributed hygiene kits and tarps for emergency shelter to families devastated by Hurricane Maria. 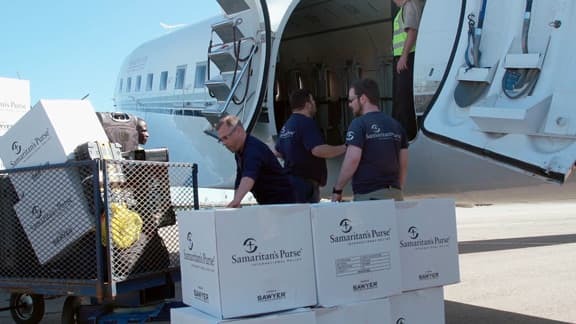 San Juan, Puerto Rico—Samaritan’s Purse airlifted more than 546 tons of emergency relief supplies to the Caribbean after Hurricanes Irma and Maria. Dominica—Samaritan’s Purse distributed emergency shelter materials to more than 10,000 families following Hurricane Maria. Dominica—After Hurricane Irma and Maria devastated the Caribbean, Samaritan's Purse established ten community water filtration units to provide drinking water to families in need. Dominica—Samaritan’s Purse provided clean water to more than 6,000 people following Hurricane Maria. 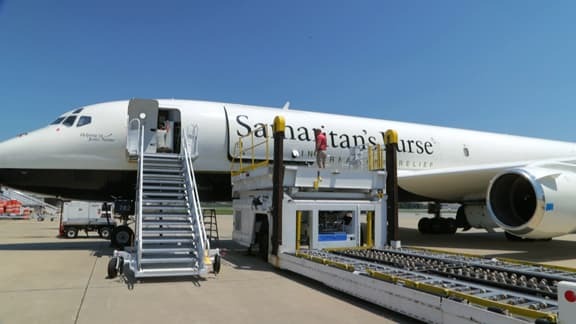 The Samaritan's Purse DC-8 is configured to carry 32 passengers and up to 84,000 pounds of cargo. This puts staff and resources on the ground in record time following a disaster. Haiti—After Hurricane Matthew, Samaritan’s Purse conducted eight airlifts using its DC-8. These airlifts delivered more than 8,000 blankets, 8,000 hygiene kits, 31,700 shelter tarps, 11,300 filtration systems and a cholera treatment center. Haiti—After Hurricane Matthew, Samaritan's Purse distributed more than 31,000 emergency shelter tarps. Wardak, Iraq—A young boy carries part of his family's monthly food ration back to his tent in a refugee camp. Wardak, Iraq—Samaritan’s Purse distributed blankets and shoes to families displaced by ISIS. Wardak, Iraq—Samaritan’s Purse distributed blankets and shoes to families displaced by ISIS. Wardak, Iraq—Samaritan’s Purse distributed 3-day food rations, blankets, cook stoves and other critical supplies to families in need. Chardonnieres, Haiti—Dr. Joe Lamb and nurse Summer Blackwell treat a patient suffering from cholera. Les Cayes, Haiti—Samaritan’s Purse distributed heavy-duty plastic sheeting, water filtration systems and hygiene kits to families affected by Hurricane Matthew. Les Cayes, Haiti—Samaritan’s Purse distributed heavy-duty plastic sheeting, water filtration systems and hygiene kits to families affected by Hurricane Matthew. 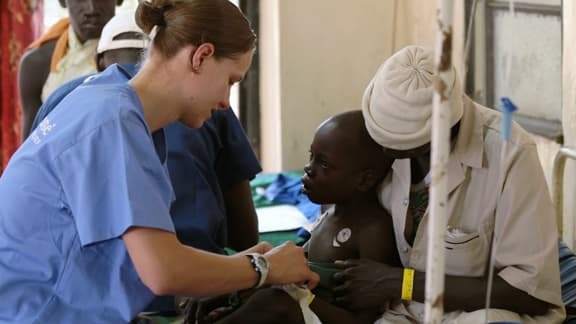 Yida, South Sudan—Samaritan's Purse staff test children for malnutrition. Nepal—After a devastating earthquake, Samaritan’s Purse delivered winterization kits stocked with blankets, jackets, socks, hats and other supplies to survive the harsh winter. In 2016, Samaritan's Purse provided more than 400,000 people with safe drinking water from over 275 constructed or rehabilitated water points. Haiti—Samaritan’s Purse provided more than 40 tons of critical relief supplies to families affected by Hurricane Matthew, including water filtration units, blankets, hygiene kits and plastic sheeting. Ecuador—Ready to deploy at a moment’s notice, the emergency field hospital provides medical relief in disaster-stricken areas where the medical infrastructure is damaged, overwhelmed or nonexistent. Ecuador—The emergency field hospital expands the Samaritan’s Purse medical response capacity by quickly putting the right equipment and resources in disaster areas. Ecuador—With two operating rooms, the emergency field hospital enables surgeons to perform 15-25 surgeries daily. 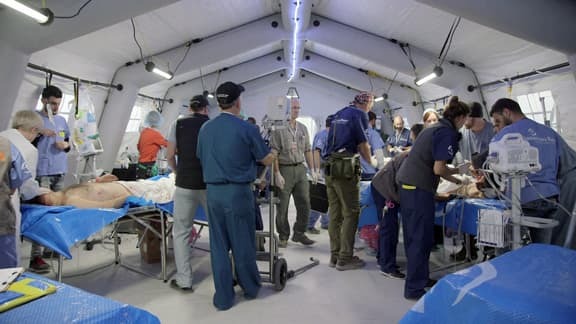 Ecuador—With all of its components combined, the emergency field hospital functions as a full hospital giving medical personnel the capacity to treat more than 100 patients each day and perform 15-25 surgeries daily. Ecuador—Dr. Tenpenny and Dr. Furman analyze an ultrasound at the emergency field hospital. Ecuador—Nurse Kelly Sites provides expert care to a patient in need following a devastating earthquake. Ecuador—The hospital is staffed with 20–60 medical personnel, including highly skilled physicians, nurses, surgeons, lab technicians, anesthesiologists and pharmacists. Ecuador—Samaritan’s Purse aims to serve as many people as possible with emergency medical care while also ministering to their spiritual needs. Ecuador—The emergency field hospital arrives with all of the necessary equipment to be self- sufficient, including generators and water purification systems. Ecuador—The goal is to have the hospital up and running within 24 hours of arriving on-site. Mosul, Iraq—A Samaritan’s Purse nurse cares for a child at the organization's emergency field hospital. Mosul, Iraq—The Samaritan's Purse medical team provides life-saving emergency care on the frontlines of the battle for Mosul. 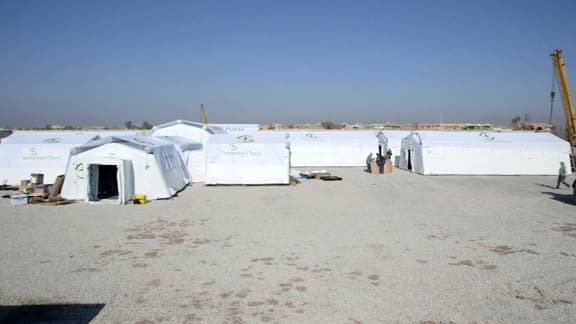 Mosul, Iraq—This mobile field hospital expands the Samaritan's Purse medical response capacity by quickly putting the right equipment and resources in disaster areas. Mosul, Iraq—More than 4,000 victims of war received medical care at the Samaritan's Purse emergency field hospital in Iraq. Mosul, Iraq—More than 4,000 victims of war received critical medical care at the Samaritan's Purse field hospital in Iraq. Mosul, Iraq—Samaritan’s Purse surgeons performed more than 1,700 major surgeries at the emergency field hospital in Iraq. Mosul, Iraq—Roughly 40% of patients at the emergency field hospital in Iraq were women and children. Mosul, Iraq—Samaritan’s Purse medical staff provided trauma care to more than 4,000 victims of war during the battle for Mosul. Mosul, Iraq—Samaritan’s Purse nurse, Katie Morales, comforts a young girl who was critically injured in the battle for Mosul. North Wilkesboro, North Carolina—in the wake of a natural disaster in the U.S., Samaritan’s Purse immediately responds with a Disaster Relief Unit—a tractor-trailer stocked with tools, chainsaws, and emergency relief supplies. 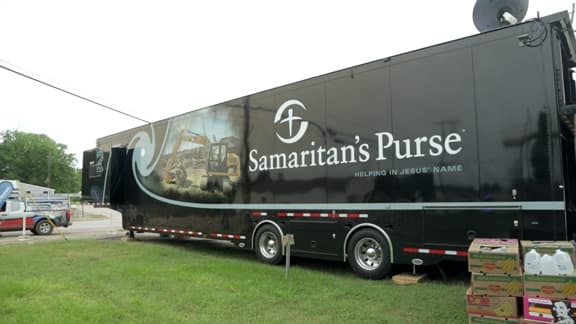 North Wilkesboro, North Carolina—Samaritan’s Purse has eight Disaster Relief Units stocked with critical relief supplies. 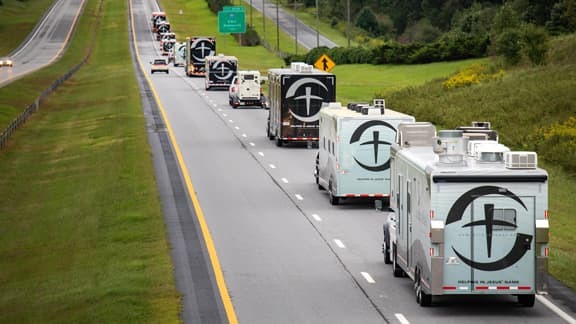 These tractor-trailers are ready to respond immediately to a natural disaster and serve as the base of operations for Samaritan’s Purse teams. 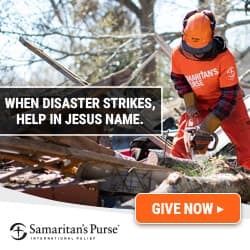 New Bern, North Carolina—Samaritan’s Purse volunteers remove water-damaged drywall and insulation from a home flooded by Hurricane Florence. New Orleans, Louisiana—A Samaritan's Purse volunteer secures a tarp to the roof of a home devastated by a powerful tornado. Redding, California—After the Carr Fire destroyed nearly 1,000 homes in Shasta County, California, Samaritan’s Purse volunteers help homeowners recover precious items like jewelry and photo albums from the ashes. Redding, California—By sifting through the ashes for personal belongings, Samaritan's Purse volunteers provide a sense of closure for families affected by wildfires. Paradise, California—Samaritan’s Purse volunteers sift through the ashes to salvage priceless personal belongings. Regardless of monetary value, discovered items often become invaluable to families who have lost everything. Paradise, California—A tractor-trailer stocked with critical relief supplies is deployed in the aftermath of a natural disaster. Here, Samaritan's Purse volunteers pray before helping families affected by the Camp Fire. New Bern, North Carolina—Volunteers comfort Kathy Warren (left) and Robin Hollingsworth (right) after Hurricane Florence flooded their neighborhood. Jacksonville, North Carolina—Teams of volunteers remove downed trees, clear debris, and mud-out homes for families affected by Hurricane Florence. New Bern, North Carolina—Hundreds of families lost everything in Hurricane Florence floodwaters. 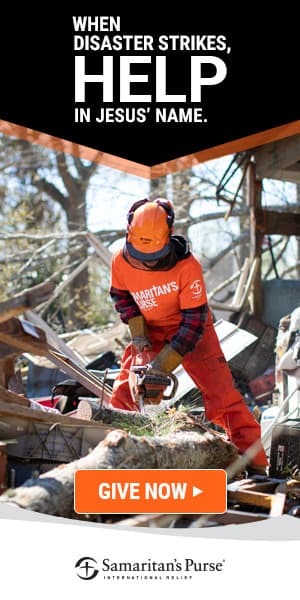 Samaritan's Purse volunteers helped families salvage personal belongings, mud-out their homes and clear storm debris. Jacksonville, North Carolina—Homeowner Mary Kerns shows Samaritan's Purse volunteers a family photo, salvaged from the Hurricane Florence floodwaters that destroyed her home. Tractor-trailers stocked with emergency relief supplies deploy to the hardest-hit areas of the Carolina coastline following Hurricane Florence. Weslaco, Texas—Once Samaritan's Purse has completed work on a home, all of the volunteers write heartfelt messages in a Bible and present it to the homeowner. Pinetops, North Carolina—Volunteers work to rebuild Bettie Lindsay’s home after it was destroyed during Hurricane Matthew. Pinetops, North Carolina—A Samaritan’s Purse volunteer puts the finishing touches on a new home. In 2018, 16,932 volunteers served more than 487,115 hours with Samaritan’s Purse, helping some 4,500 families recover from disasters. 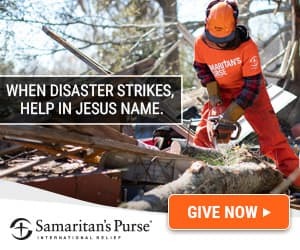 Since 1998, Samaritan’s Purse has responded to 223 domestic disasters in 37 states, helping more than 43,000 families. Samaritan’s Purse and its army of volunteers work to help families recover after the storm. 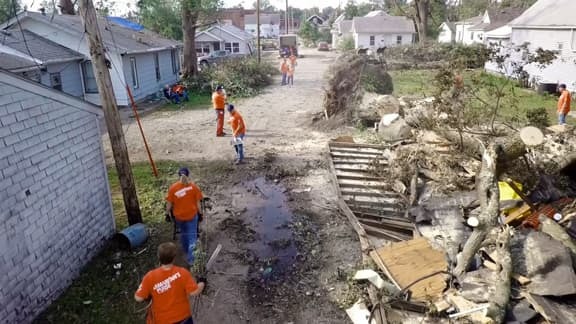 Depending on the nature of the disaster, volunteers will tear out damaged drywall, remove flooring, tarp damaged roofs, clear debris or help homeowners salvage personal belongings. Zambia, Africa—Dr. Kevin Kerrigan preforms surgery at Chitokoloki Hospital. Zambia, Africa—Nurse Leslie Kerrigan serves at Chitokoloki Hospital. Zambia, Africa—Dr. Missy Sandberg serves at Mukinge Mission Hospital. Zambia, Africa—Dr. Missy Sandberg examines x-rays at Mukinge Mission Hospital. Zambia, Africa—Dr. Daren Tompkins cares for patients at Mukinge Hospital. 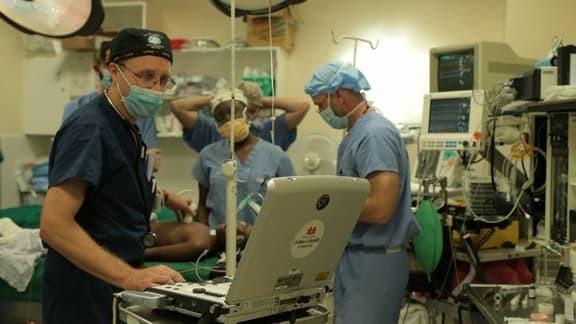 World Medical Mission serves as a lifeline to dozens of mission hospitals by providing millions of dollars worth of critically needed equipment and supplies. Zambia, Africa—Dr. Kevin Kerrigan performs surgery at Chitokoloki Hospital. Kenya, Africa—There is a need for many different specialists, including dentists, to serve with World Medical Mission. Anu’s heart defect was discovered during routine vaccinations in Mongolia. She received life-changing heart surgery through Children's Heart Project. A young Mongolian boy prepares to receive heart surgery through Children's Heart Project. Through this experience, he and his mother heard the Gospel. Nurses from all over the country donate their time to Children's Heart Project, helping children with life-threatening heart conditions. Five-year-old Ostin Jesus Villarroel Ramos from Bolivia is all smiles as he poses with his Children's Heart Project host parents, Bentley and Maureen Robinson, in Grand Cayman. Tania is one of more than 1,312 children who have received life-saving surgery through Children's Heart Project since 1997. Children’s Heart Project works with top-quality hospitals to provide surgery for children who live in countries where the required medical expertise and equipment are not available. Nicolas Sempertequi and his mother Marcia read a book as they prepare for life-saving heart surgery through Children's Heart Project. Children’s Heart Project identifies children with life-threatening heart disease in countries that lack technology and training and matches them with North American hospitals and surgeons that donate their time and services. Children’s Heart Project provides airfare for a child, a parent, and a translator and finds them a host home through a local church. Lake Clark, Alaska—Since Operation Heal Our Patriots began in 2012, 412 individuals have made commitments to Jesus Christ, and 516 participants have been baptized. 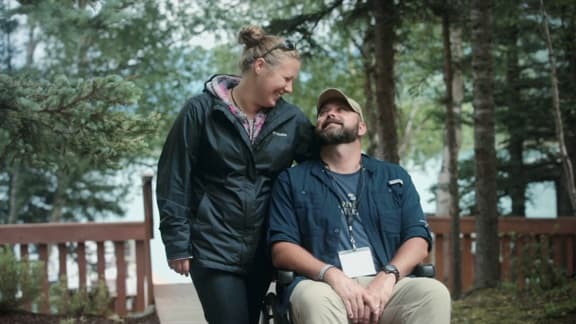 Lake Clark, Alaska—Operation Heal Our Patriots gives wounded veterans and their spouses the opportunity for spiritual refreshment, physical renewal and marriage enrichment. Lake Clark, Alaska—Since Operation Heal Our Patriots began in 2012, 412 individuals have made commitments to Jesus Christ, and 516 participants have been baptized. Lake Clark, Alaska—Since the program began, more than 481 couples have rededicated their marriages to God at Samaritan Lodge Alaska. 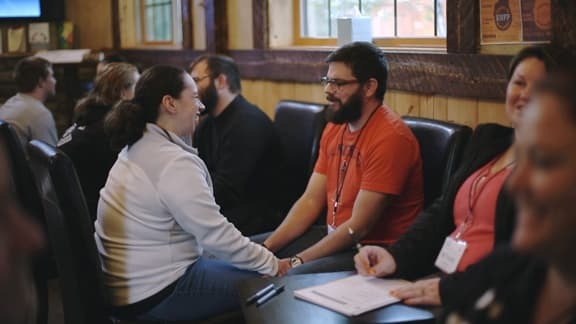 Lake Clark, Alaska—Since the program began, more than 481 couples have rededicated their marriages to God at Samaritan Lodge Alaska. Lake Clark, Alaska—Kayaking in Lake Clark helps couples focus on working together as a team. Lake Clark, Alaska—Army Specialist Nat Hughes and his wife Angie enjoy fishing in Lake Clark during their week at Samaritan Lodge Alaska. Lake Clark, Alaska—Army Sergeant Vernon Mitchell and his wife Denise were both baptized at Operation Heal Our Patriots. Lake Clark, Alaska—Lindsey, wife of Marine Gunnery Sergeant Dustin Hughes, was baptized at Operation Heal Our Patriots. Lake Clark, Alaska—Couples enjoy a day of bear viewing in the wilderness. Lake Clark, Alaska—Army Corporal Wes Farron and his wife Melanie broke the record for the biggest catch during their week of marriage enrichment at Samaritan Lodge Alaska. Lake Clark, Alaska—Army Sergeant Vernon Mitchell and his wife Denise practice their communication skills during one of the marriage enrichment courses. Lake Clark, Alaska—Marine Gunnery Sergeant Dustin Hughes enjoys a day of fly fishing. 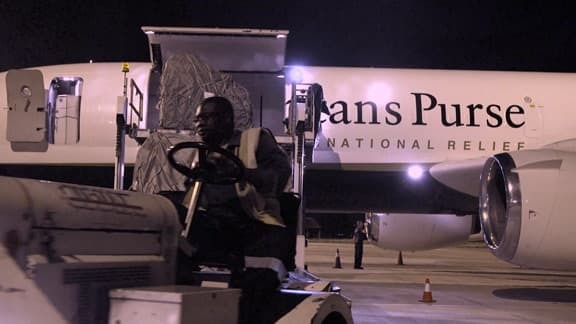 Samaritan's Purse airlifted 27 tons of critical relief supplies to Beira, Mozambique following Cyclone Idai. This flooded area is home to several families who lost their roofs in the storm. Even in this devastation, they are thanking God for their lives. Lydia was one of the first families to receive a tarp from Samaritan's Purse after her roof was blown off during Cyclone Idai. Samaritan's Purse prepares to distribute emergency shelter material to hundreds of families affecteedby Cyclone Idai. Samaritan's Purse gave homeowner Maria Macheze a tarp after Cyclone Idai ripped off her roof. Samaritan's Purse staff prays for Lydia after giving her a new tarp for the home she was raised in. Samaritan's Purse distributed a tarp to Virginia, a homeowner in Beira. She is excited for her family to now have a dry place to sleep. Samaritan's Purse airlifted 27 tons of critical relief equipment and a mobile medical team to Beira, Mozambique following Cyclone Idai. The Samaritan's Purse DC-3 allows critical relief supplies to be delivered to families in even the hardest-to-reach areas of Mozambique. Our PSAs are available for use by media outlets and websites in the United States. Unless a kill date is noted, PSAs can be aired indefinitely. If you would like to automatically receive new PSAs from Samaritan’s Purse, please email jcaudill@samaritan.org with your request.